An eLawCounsel attorney will draft your entertainment agreements for your production, entertainment or record company for a low rate. Need an attorney to draft a contract? Attorney Meaghan Roberts will draft your contract at a low set fee. 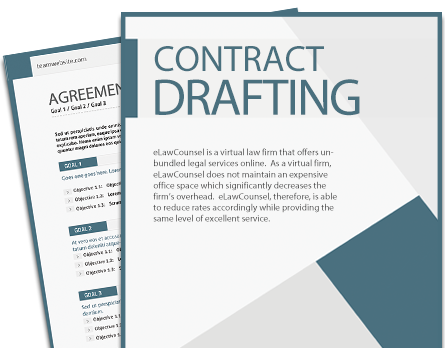 eLawCounsel is a virtual law firm that offers legal contract drafting services for a fraction of the price a client would pay at a traditional law firm. No hourly billing, no unnecessary high retainers, no unexpected fees and no wasting valuable time going to a stuffy law office. Your eLawCounsel Attorney will draft your contracts for your entertainment or corporate business. For more information, click Contact above and submit your question or Call (206) 350-0565. Meaghan Roberts earned her Juris Doctorate and Masters of Dispute Resolution at Pepperdine University School of Law in Malibu, CA. She is a member of the California and Texas State Bars. An eLawCounsel attorney will draft your entertainment agreements for a low set price. For more information on how eLawCounsel can help you, click the Contact link above. Need a contract for your business? eLawCounsel Attorney Meaghan Roberts will write your contacts to secure the legal rights for your business. IMPORTANT NOTICE: This website is directed only to those persons who reside or conduct business in California or Texas, and nothing on this website is intended as a solicitation of clients in other jurisdictions. The information regarding legal issues may apply only in California or Texas. Nothing on this website should be construed as legal advice or an offer to enter into an attorney-client relationship. Information on this website is general in nature and there is no representation or warranty that the information is current or accurate or applies in any particular case.